Super Eagles striker, Odion Ighalo,has admitted that his move to China was to save his career at the expense of his love for the English Premier League (EPL). According to him, he moved on from Watford to Chinese side Changchun Yatai after West Bromwich Albion’s interest came to nothing. Ighalo, whose last season with Watford was far from the standards he set in his debut campaign in the EPL, revealed that he struggled to cope with the new systems of the new manager Walter Mazzarri at Watford. 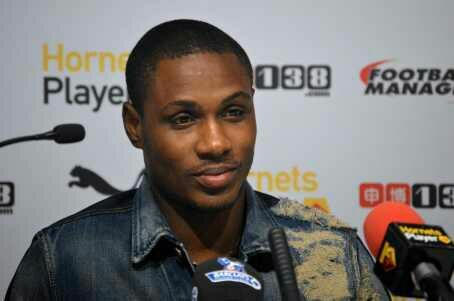 In an interview with Sky Sports, Ighalo said: “I moved (to China) because that was what was best for me. “West Brom did not meet Watford valuation but when the Chinese offered £20m, it was not bad cash for Watford. “My second season in the PremierLeague was not that great, we had a new manager and new system, which meant I played on the left and sometimes on the right. It was difficult, everything was not going right and I did not find it easy. “I did not get much playing time and so I had to leave, and it didn’t matter where I went to. “I didn’t want problem with my manager. It was difficult for me as I wanted to stay in the Premier League. “I had a great time with Watford, from the Championship to Premier League. “The fans still close to my heart, the players. “Troy Deeney is a great guy, in and out of dressing room, a fighter, who chases every ball. It was a pleasure to play alongside him and my connection with him was exceptional.